It’s summertime and the weather is hot but the mercury isn’t the only thing that’s on the rise. If you’re constantly running the AC to keep cool, you may see your utility bills climb to astronomical proportions. Making some energy efficient home improvements is a smart way to reduce your cooling costs and could potentially save you some big bucks at tax time. The Internal Revenue Service offers several tax credits for homeowners who invest in eco-friendly improvement. Geothermal heat pumps function in a way that’s similar to a traditional heat pump but with one key difference. Rather than using outside air to run your home’s HVAC system or heat up your water, these pumps use natural heat that’s trapped in the ground. According to the U.S. Department of Energy, an Energy Star-certified geothermal pump is roughly 45% more energy-efficient than the standard option, potentially saving you several hundreds of dollars each year. Homeowners can apply for a tax credit for up to 30% of the heat pump’s cost, including installation. The credit, which expires December 31, 2016, applies to existing homes and homes that are still under construction. You can use the credit if you install a geothermal pump at your principal residence or a second home you own but improvements at rental homes are not eligible. Installing solar panels or a solar water heater can dramatically reduce the cost of powering your home. A solar panel system is designed to capture the sun’s energy and convert it to electricity while solar water heaters use sunlight to heat and circulate water throughout the home. Installing either type of technology can dramatically cut your energy usage and potentially can cut your utility bills in half. The tax credit guidelines for geothermal heat pumps also apply to solar energy systems. 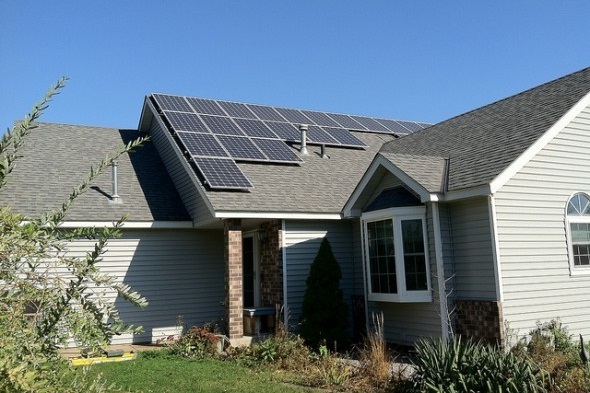 In addition, the solar system you install must generate at least half of your home’s energy. For solar water heaters, the credit only applies to residential use which means you can’t claim it for installations that solely power swimming pools or hot tubs. If you’re installing solar panel improvements, they must meet state and local fire and electrical code requirements. Wind turbine systems harness the wind’s energy and convert it to electricity, which you can then use to power your home. These systems can be used in conjunction with or independently of the traditional electric grid. Generally, you need to live in an area with an average annual wind speed of at least 9 to 10 miles per hour for this type of system to work most efficiently. If you decide to install a wind turbine system, you’ll have to choose a model with a nameplate capacity of no more than 100 kilowatts to qualify for the tax credit. The credit, which can be applied to up to 30% of the cost, including installation, is good through the end of December 2016. Fuel cell systems are the latest innovation in green technology. Typically, an individual fuel cell uses a combination of hydrogen and oxygen to produce clean energy. Residential systems can be used to provide electricity or heat your water, slashing your utility costs by up to 50% annually. The tax credit for fuel cell installations is 30% of the cost, up to a limit of $500. The credit, which expires in December 2016, is available for systems installed at new and existing homes, as long as it’s your principal residence. That means you can’t claim the credit for installations made at rental or second homes. While you may spend a little more up front to install one of these energy-efficient systems, the investment can pay off in terms of what you’ll save over the life of the unit. When you factor in the added benefit of a tax credit, these environmentally conscious home improvements become even more affordable.